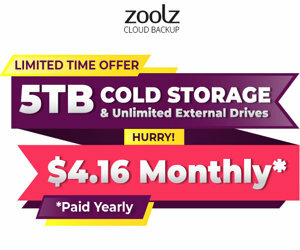 Zoolz is a market leading provider, which uses Cloud Storage Technology to securely backup, archive and safe keep huge amounts of data to the cloud for a lifetime. It lets you move Internal, External and Network drives to the cloud. You can backup all your important data, documents, photos, videos, mp3 and other files to the Zoolz Cloud storage. Drag-drop to upload your files and folders anywhere. 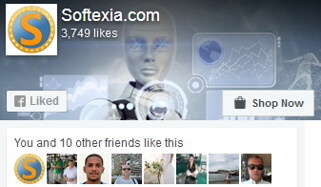 Later you can share any encrypted file easily via direct link, email, or social post. Zoolz provides a preview of your backed up RAW and jpeg photos stored on Cloud Storage. Also you can click on any office document or PDF to view it using Google Docs. The service allows you to Search your files instantly. Supports multiple backed up computers. Zoolz is a secure and reliable Cloud Solution. It uses worldwide Amazon infrastructure, trusted by business giants like NASDAQ, National Institutes of Health, NASA, and more. Amazon AWS currently protects, stores, and processes billions of files and millions of requests every day. Zoolz Mixed plans with Instant Vault and Cold storage together! The intuitive design combines enterprise level features such as scalability, centralized management, reliability, data tiering and more. Unlike other services, Zoolz does not cap bandwidth upload/download speeds nor does it set upload/download file size limitations. You can use quality cloud backup feasible for all businesses. Zoolz uses 256-AES encryption and stored on 256-AES encrypted Amazon S3 servers. This level of security complies with all laws and regulations for safely processing, transferring, and storing data. Such as Sarbanes-Oxley Act, HIPPA, PCI-DSS, GLBA, FISMA, and the Joint Commission. The service uses the enterprise level, secure and reliable Amazon S3 Data centers. Your backups are duplicated and stored over multiple facilities across the globe ensuring on-demand data availability. All major computation is done on the back end cloud. That offers smooth backup and minimum performance impact on your side. The powerful, lightweight file browser allows you to view image previews of all your RAW camera and jpeg images, instantly search all your files, share with ease, and more. You can also drag-drop to upload any files or folders anywhere and create new folders. With innovative Cloud Storage, you can instantly backup all your rarely accessed files for cheaper than storing on-premises. 100GB for only $3/month! Your files will be stored on the secure, reliable, and durable Amazon AWS that requires 3-5 hours restore time. Once your files are ready to be downloaded, you will receive an email to restore. The service offers Copy, Encrypt and Ship to handle big data and accelerate the backup process. Just use an easy to use utility to copy and encrypt your data on your external media. Your files will be processed with zero knowledge to our data centers. You can use this service at anytime whenever you need to add more files. With intuitive on-the-fly decryption, you can access your encrypted backed up files. Moreover, you can view photos, play videos and music, share files. Also you can save them for editing and offline viewing.